Impetigo is a skin infection that tends primarily to afflict children. Impetigo caused by the bacterium Staphylococcus aureus (also known as staph) affects children of all ages. Impetigo caused by the bacteria called group A streptococci (also know as strep) are most common in children ages two to five. The bacteria that cause impetigo are very contagious. They can be spread by a child from one part of his or her body to another by scratching, or contact with a towel, clothing, or stuffed animal. These same methods can pass the bacteria on from one person to another. Impetigo tends to develop in areas of the skin that have already been damaged through some other mechanism (a cut or scrape, burn, insect bite, or vesicle from chickenpox). The first sign of bullous impetigo is a large bump on the skin with a clear, fluid-filled top (called a vesicle). The bump develops a scab-like, honey-colored crust. There is usually no redness or pain, although the area may be quite itchy. Ultimately, the skin in this area will become dry and flake away. 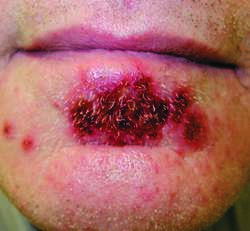 Bullous impetigo is usually caused by staph bacteria. Epidemic impetigo can be caused by staph or strep bacteria, and (as the name implies) is very easily passed among children. Certain factors, such as heat and humidity, crowded conditions, and poor hygiene increase the chance that this type of impetigo will spread rapidly among large groups of children. This type of impetigo involves the formation of a small vesicle surrounded by a circle of reddened skin. The vesicles appear first on the face and legs. When a child has several of these vesicles close together, they may spread to one another. The skin surface may become eaten away (ulcerated), leaving irritated pits. When there are many of these deep, pitting ulcers, with pus in the center and brownish-black scabs, the condition is called ecthyma. If left untreated, the type of bacteria causing this type of impetigo has the potential to cause a serious kidney disease called glomerulonephritis. Even when impetigo is initially caused by strep bacteria, the vesicles are frequently secondarily infected with staph bacteria. Impetigo is usually an uncomplicated skin condition. Left untreated, however, it may develop into a serious disease, including osteomyelitis (bone infection), septic arthritis (joint infection), or pneumonia. If large quantities of bacteria are present and begin circulating in the bloodstream, the child is in danger of developing an overwhelming systemic infection known as sepsis. Prevention involves good hygiene. Handwashing; never sharing towels, clothing, or stuffed animals; and keeping fingernails well-trimmed are easy precautions to take to avoid spreading the infection from one person to another. "Bullous Impetigo." Archives of Pediatrics and Adolescent Medicine 151, no. 11 (November 1997): 1168+. Systemic — Involving the whole body; the opposite of localized. Ulcer — An irritated pit in the surface of a tissue. Vesicle — A bump on the skin filled with fluid. a contagious skin disorder, caused by streptococci, staphylococci, or a combination of organisms and marked by vesicles or bullae that become pustular, rupture, and form yellow crusts; called also impetigo contagiosa or impetigo vulgaris. Impetigo usually occurs in children, especially very young infants because of their low resistance, and is spread by direct contact with the moist discharges of the lesions. If not properly treated, it can be serious or even fatal to newborn infants. Isolation of the patient is recommended if patient hygiene is poor or the patient is a newborn in a hospital. Gowns and gloves are worn if soiling is likely. Impetigo is a particular problem for hospital patients, who may become infected by infected hospital staff. Treatment may consist of local applications of an antibiotic ointment, keeping the lesions and surrounding skin clean, and exposing the lesions to air to encourage drying. Systemic antibiotics are often recommended. (See Atlas 2, Part G). bullous impetigo a highly contagious type of impetigo, caused by Staphylococcus aureus and characterized by large pustules surrounded by reddened areas; transmission is by direct contact, by fomites, or by autoinoculation causing secondary infections in areas of the body not originally affected. impetigo bullo´sa , bullous impetigo impetigo in which the developing vesicles progress to form large bullae, which collapse and become covered with crusts. impetigo herpetifor´mis a very rare, acute dermatitis with symmetrically ringed, pustular lesions, occurring chiefly in pregnant women and associated with severe constitutional symptoms. impetigo neonato´rum impetigo bullosa of newborn infants. A contagious skin infection, usually of children, that is caused by staphylococcal or streptococcal bacteria and is marked by superficial pustules and thick yellow crusts, commonly on the face. a streptococcal, staphylococcal, or combined infection of the skin beginning as focal erythema and progressing to pruritic vesicles, erosions, and honey-colored crusts. Lesions usually form on the face and spread locally. The disorder is highly contagious through contact with the discharge from the lesions. Acute glomerulonephritis is an occasional complication. Treatment includes thorough cleansing with antibacterial soap and water, compresses of Burow's solution, and topical or oral antibiotics. Treatment of the sores, use of individual washcloths and linens, and scrupulous handwashing help prevent spread of the infection. impetiginous [im′petij′inəs] , adj. 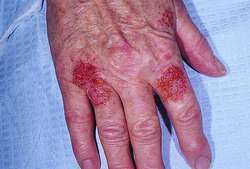 A common, highly infectious, skin disease caused by STAPHYLOCOCCUS infection. Impetigo is commonest in children, and in hot, moist climates. In temperate areas, widespread impetigo is usually an indication of inadequate standards of personal hygiene. It feature rapidly spreading small blisters which soon turn to golden-green crusts. Treatment is by thorough skin cleaning and the use of antibiotic ointment. Contagious dermatologic pyoderma, caused by Staphylococcus aureus and/or group A streptococci, which begins with a superficial flaccid vesicle that ruptures and forms a yellowish crust; most commonly occurs in children. Q. do you know anything about impetigo? there is any cure for this? A. antibiotics? not for me! maybe something else? thanks..